Once upon a time, most freshwater was pure and drinkable. Back then, a major risk was contracting a waterborne infection such as giardia. Now, contaminants from factories, industrial farms, and transportation hubs permeate the water table. Industrial waste and agrochemical runoff aren’t the only sources of contamination. Humans join in the polluting by flushing pharmaceutical drugs and common household chemicals down the drain. Municipalities add inorganic fluoride, now known to be cytotoxic, and chlorine that breaks down into disinfection byproducts, increasing our risk of bladder, colon, rectal, and brain cancer. A more recent study tested effluent from 50 large wastewater treatment plants across the U.S. for active pharmaceutical ingredients and found that every sample contained measurable levels of the blood pressure-regulating drug hydrochlorothiazide, with several other drugs appearing in 90% of the samples taken. Bottled water appears no safer than tap water, and the plastic bottles leach chemicals. Anyone who has taken a sip of water from a bottle left on the dashboard of a car on a hot, sunny day will immediately taste this truth. And many brands of bottled water are filled from tap water sources. If your home plumbs to a municipal water supply, you will get limited details about the water quality from the treatment facility. Those with a well get even less information from a private well check. The best option is to test your own water with a home kit that offers a robust evaluation of common contaminates. This can be a worthwhile investment to determine what you are being exposed to, such as chemicals, heavy metals, particulate matter, and even radiation. 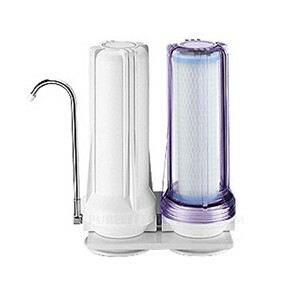 The basic mechanism of home filtration is a block of carbon to draw out organic pollutants and the chemicals added to the water supply for disinfection, such as chlorine. If there is fluoride in your water, an additional second-stage filter is needed for its removal. Although effective, distillation and reverse osmosis units are more expensive for home use and leave water completely devoid of beneficial minerals. If you choose one of these methods, be sure to add a pinch of unprocessed mineral-rich salt to a glass of water to replenish minerals in the water. At our clinic, we endorse PureEffect multistage filtration systems as an economical means to purify water of the most common contaminates. Different levels of filtration are available to meet varying needs in both under-counter and countertop models. If you are unsure where to start, have your water tested by an independent lab with a home test kit or through a local facilities certified by the Environmental Protection Agency. Knowing your individual situation will help determine how elaborate of a home filtration system is needed to obtain pure drinking water.